It's hard for me to pick my favorite food blog. But if I could only pick 2, Jaden's Steamy Kitchen would be one of them (for the record, this is the other. Obviously.) Lots of things about Jaden inspire me: her talent in the kitchen, the flavors she uses, her ridiculous photography skills, and especially her wit, sharp writing voice, and ubiquitous presence in the food blogging world**. So you can imagine my delight when I read that Jaden is the guest host for this month's Daring Cooks challenge, Pho (Vietnamese noodle soup). We're huge fans of Vietnamese food, and Andy especially adores Pho Ga (chicken pho). We frequent our local Vietnamese restaurant/Asian grocery store at least weekly for a fix of comfort food. The Daring Cooks were given the option of preparing a short or long version of the soup. In order to make this a real challenge for myself, I made the long version, which requires making stock from scratch. I have a huge aversion to cooking with animal parts, and avoid them as much as possible. But this was supposed to challenge, so from scratch we made! I still asked Andy (sick with the flu) to hack up the chicken, but I did the rest, and I can say with a lot of satisfaction that this was another delicious Daring success. As an added bonus, the timing was perfect. Nothing's better than chicken noodle soup for a sick husband! If you've been reading along here for a while, or know me in person, you know that my most despised food is cilantro, which also happens to be a key ingredient in this dish. So, in the spirit of the challenge, I forged ahead and used it (in the broth, I skipped it as a topping). Although it's still haunting me, I'll admit I couldn't detect it in the final product. 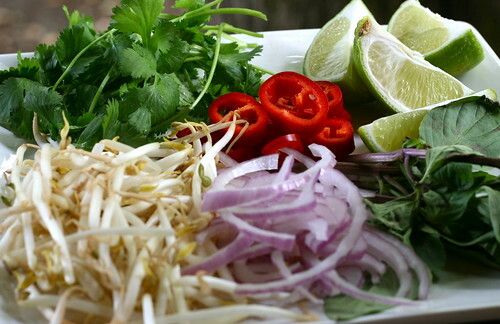 You can find Jaden's recipe for Pho Ga here. And if you're into making Asian food at home, buy her cookbook! All the cool kids are doing it. **I'm not trying to sound like a fangirl. I just think Jaden's great, okay? The fine-print blog-checking lines: The October 2009 Daring Cooks’ challenge was brought to us by Jaden of the blog Steamy Kitchen. The recipes are from her new cookbook, The Steamy Kitchen Cookbook. congrats for making stock from scratch! It looks great! haha about the cilantro....and I piled some more on top of my soup, it's one of my favorite herbs :) Your pics look great! The spices & flavors blended really well together - half of the people I served the pho too swear that they despise anise with all of their heart and soul, and yet they said in this soup that they really liked it and the anise flavor in the broth! You crack me up! Love your pictures -- the colors are beautiful. Ooh, this looks delicious! Great pictures--like Woman with a Whisk, I love the colors. Kudos for biting the bullet with both the chicken and the cilantro. It sounds like you were well rewarded! Cilantro is always good in soups. That looks wonderful by the way and a perfect soup for this cool time of year. Found your pic on Foodgawker--so my first statement is a compliment on your beautiful shot! No cilantro? ---ooh that's a tough one. Hehe, i couldnt get my boyfriend to chop the whole chicken up for me. I had to do at least half myself. 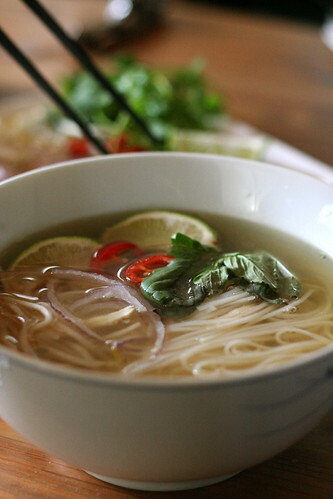 Your Pho looks really nice! 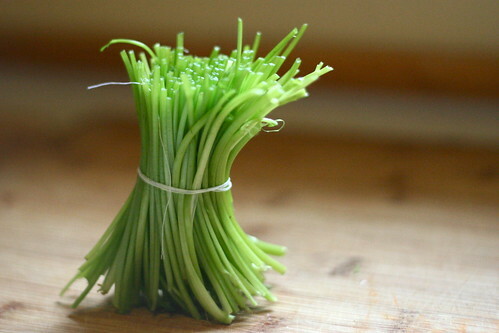 And eventho you say you hate cilantro i really like the picture of the stems you made! Beautiful,as always, but have to agree with you on Cilantro. I am not a fan myself. I can take it in very small amounts, yet there is always a bunch in my fridge. I use in my salsa for my 11 yo daughter. LOL! Thanks for the kind words about the soup, everyone! Hi Amy, thanks for stopping by at my blog so that I could get to know yours! I love the design! So simple yet effective. And beautiful pics. Wow that is totally interesting that cilantro love/hate may be genetic! I bet this was the perfect cure for your husband, hot soup and spicy sriracha will clear up a cold in a split second. Good job on this challenge. My boyfriend got sick the day before Pho-making. Do you think they planned this?! Hah! Nicely done :) Looks delicious!!!!!!!!!! Amy!! Your photos are stunning, and the post was wonderful. Awesome job! Wonderful job on the challenge and your blog is adorable by the way! Great post and I can't wait to look around your blog some more. LOL "pure evil!!!" you are too funny. when I was little, I HATE cilantro too! Then I had 2 kids. Something happened during pregnancy. And now I love the stuff. I love cilantro. My neighbor used to tell me it smelled and tasted like toilet bowl cleaner. Ugh! I know it loses its flavor when heated especially for long periods. So you probably lost the flavor due to that. 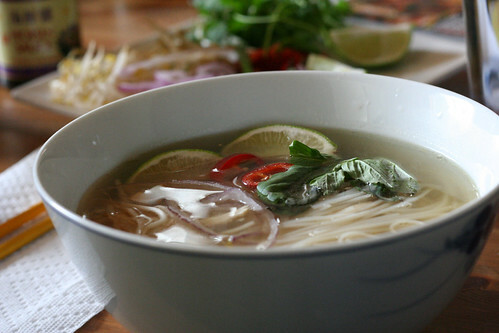 Pho is one of our favorites as well. I'll have to try the recipe. You are putting out top notch food and photos. Cilantro is your friend. Your evil little green friend. Beautiful picture! Remember my mom always put cilantro in any dish. Kind of miss it now that she is gone. Wow! I always tell myself I'm going to make stock and then I end up grabbing a box of it instead. I was actually just talking to my dad about this (he's a chef), and he suggested saving scraps when I cook... so any juices from sauteeing chicken or potato peels, etc., to make it easier. This soup looks beautiful I love the colors and the complex simplicity of it. Your soup looks so good!!! I have done the stock from scratch route before - it is totally worth it! Love the beheaded cilantro pic! Ha, ha. Great post. I used to hate cilantro so much that I didn't even want it near any food on my plate. I recall someone saying "If you don't like Cilantro, try it again..still don't like it..try it again etc etc". Well, that worked for me, and now I love the stuff. That said, your Pho looks amazing, and the photo is incredible! It makes me want to make another batch right now! Nicely done! omg so crazy about Jaden liking it after pregnancy. maybe I'll change my mind about having kids. And we're allowed to be fangirls. She rocks.